With a look that’s tailored by man and inspired by nature, the contemporary Tulip table lamp by Quasar adds an unusual focal point to any space. There’s no doubt this quirky lamp design will “illuminate” you to the world of the whimsical. Modern stainless steel bases don “flower-bud” shades. When closed, each lampshade appears as an illuminated sphere with a soft glow. 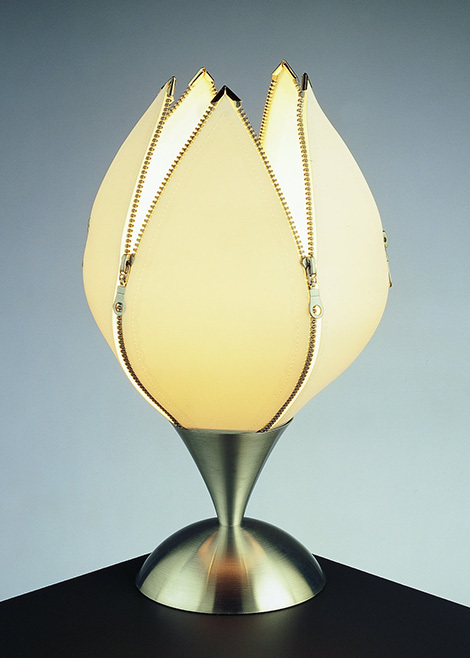 Five “petals” forming the shade open with zippers, which are prominently displayed on the exterior of the lamps in a playful twist. These lamps work especially well in lounge spaces, living rooms and libraries where they’ll be a certain conversation piece, and come in coordinating table lamp and floor lamp designs. Check out these unusual lamps at Quasar. Concealing technology behind a chic guise, the thermostatic tub shower faucet with waterfall by Tres is “tres” innovative, intelligent and esthetically impressive. The ultra-polished chrome finish and elegant shape dazzles the visual senses, while touch is in a whole other league. The cascade spout pours a healthy stream of water, cool to the touch and a soothing sound to enjoy as you soak away your troubles. The most impressive thing about this bathroom faucet is its thermostatic temperature control and display, which makes this smart fixture easy to use, even for kids. 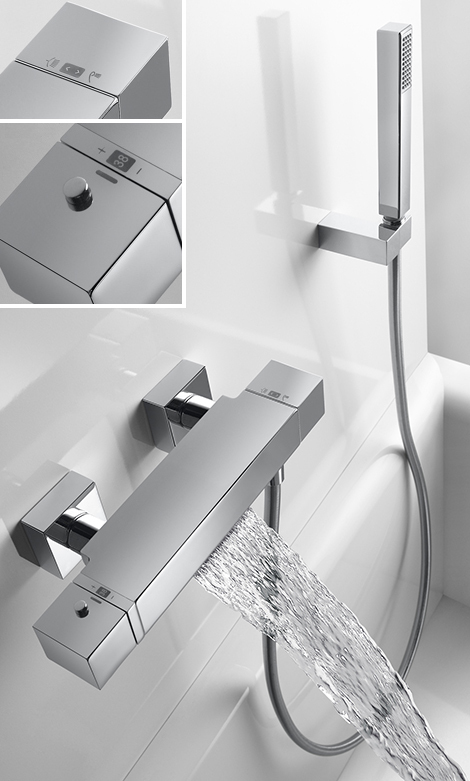 You’ll love this contemporary tub shower faucet as much for its looks as for its distinctive personality! Check it out at Tres. 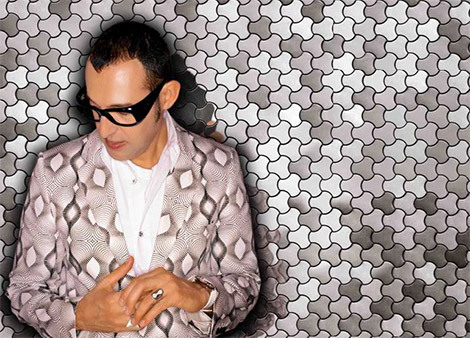 There is one designer who never fails to surprise with his slightly off-beat, significantly on-trend creations, and Karim Rashid has done it again with these modern decorative metal tiles made in collaboration with Australian company Alloy Design. The cool collection comes in eight decorative designs, each a variation of recurring cells. In repetition, these cell tiles merge into a mesmerizing 3D pattern on your walls; a look that’s high-tech and futuristic, and “in motion” as light plays off the polished metal finish. Available in steel, copper, brass, titanium and raw steel (and fittingly, by names like Flux, Infinit, Karma, Kismet, Ninja, Kink and Ubiquity) these designer tiles are unlike anything you’ve ever seen. Ideal for both indoor and outdoor applications, these metal tiles will modernize, and hypnotize! For more information visit Alloy Design. Netherlands-based company Freeline has lead the move from rustic to refined outdoors – no longer is “roughing it” an option! 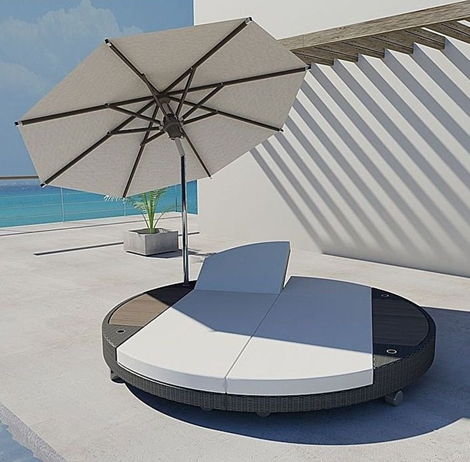 The Island sunbed lounger features a contemporary circular shape and is built for two. This outdoor oasis will pamper you from all angles, with upholstered cushions beneath you and a built-in, 360-degree tilting umbrella above, featuring a stainless steel pole and teak wood ribs. 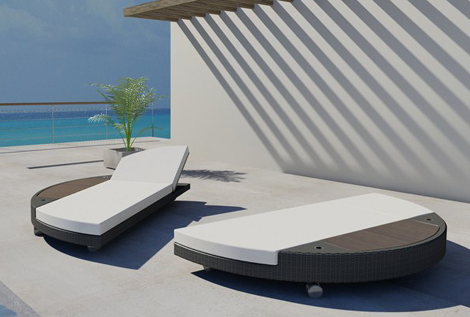 This sunbed can be placed as a single unit or pulled apart for two individual beds, for fun in the sun and the shade. The Island collection also includes a circular sofa set with a matching coffee table, and the Island lounger. Coordinate your outdoors in style, with the Island collection from Freeline. These are some of the worlds most creative and strangest chairs! From the ghost chair to the Obelisk Chairs and even chairs inspired by the female form! Enjoy these 20 most creative chairs! This is a Ghost Chair collection by Design Drift. The plexiglass chairs have ghost-like forms inside them, created with laser technology. The ghost is a futuristic concept of a chair, 3-dimensionally captured within the boundaries of reality. It gives you a bit of a dramatic feeling: unbelievable, high-tech, but beautiful.